Proton Persona Facelift 2010, or as Proton would like to call it – Proton Persona Elegance. The car just launch today and we manage to get many photos from the local Proton Showroom. The Proton Persona Elegance has new bumper, new foglights design, new headlights with black background and the new grille to match the refresh look. 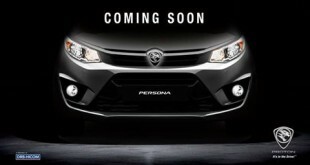 Not to forget the new facelift version of Persona comes with new design full bodykit as standard. From the rear of the Persona Elegance as many claims from spyshot before the launch it has rear LED lights. I was wondering where did i saw similar rear lights design before – Top and Bottom Red, Middle transparent. After digging through my memories of automotive industry – i recall that, The New Mercedes E-Class is also having the similar design. No wonder, it’s call Persona Elegance. Of course it also comes with a rear bodykit and a nicer finish of tailpipe. A bootlip is also fitted into the New Persona.As a side note, the model with photos here it’s a Proton Persona Elegance Medium Line with manual transmission. Many wonder is there any improve in the power/engine of the New Persona Elegance. The answer is No. There’s no Campro CPS option still as for now. It is still the 1.6-litre Campro IAFM engine with 110 bhp at 6,500 rpm and 148 Nm of torque from 4000 rpm which is available from the old Persona. However the dashboard meter design has been change to have a sportier look. We also got to know that this Persona is equipped with a new 32-bit siemens ECU that allows more configuration and integrated to more systems in the car. The dealer was nice to me and explain almost every single new feature in the new Proton Persona Elegance to me. I was also told that the new fabrics has been fitted in to the B-Line and M-Line model. I had a chance to sit and feel it, in my personal opinion – i think it has better quality than the older one. The older one was softer and more “towel” type. As for the H-Line it is fitted with leather seats. New side mirrors now come with signal lights fitted to the new Proton Persona.However there’s still no auto folding for the side mirrors. Medium line and High Line get electric adjustable side mirror. The facelifted Persona, is also equipped with a new audio system by Blaupunkt. The new audio USB jack for thumbdrives and Aux in capabilities. Only the Baseline does not get steering audio controls for the audio system.The Medium Line and High Line gets GPS system from Proton as an external piece. The Medium Line and Baseline gets rear drums brakes and as for the High Line,disc brakes is fitted front and rear. As for the wheels, Base Line gets steel rims, Medium and High line gets Alloy rims both tyres are 195/60R15 as the specs indicated. Medium Line and Base Line has an option of Manual or Auto Transmission. The High Line Proton Persona Elegance only comes with Auto transmission. I was told that the baseline has a slight reduction, medium line has an increment of RM2000+ as for the Highline, the price remains the same. The sales adviser also claim that it is more value for money to purchase the High Line version. For those who into white cars lately, there’s no white Persona this round, and Red which code name as Brilliant Red is only available if you choose to purchase the High Line Persona Elegance. 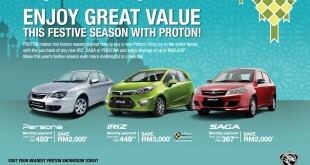 On top of that, Proton Persona Elegance come with two new colours which is Bronze Garnet and Chiffon Green. The above photo is Bronze Garnet Proton Persona (more photos check out our gallery below). Of course the all time Malaysian’s favourite colour – Silver is also available and Black too. The Highline of Proton Persona Elegance gets much more goodies, such as remote trunk release, auto cruise. Notice in the photo there’s one nice luggage tray which is only available for Medium Line and above. Proton Persona Elegance comes with ABS & EBD for High line. High Line Persona also gets dual air bag & both pre-tensioner seatbelts while Medium Line Persona gets driver side air bag & pre-tensioner seat belt. As for baseline Proton Persona, not of the above is available with it, so drive extra safely. The Facelifted Proton Persona is available in most of the Proton Showroom. The Proton Persona Elegance comes with with a 2-year or 50,000 km warranty and a 3-year/125,000 km extended warranty program – that’s total of 5 years and 175,000 km. As summary the facelift Proton Persona definately it’s a better car compare the the old one overall.Do Check out Proton Persona Elegance or Proton Persona Facelift Gallery below for more details shots.